Another weird and wonderful offering from Intelligent Devices, but you might want to hang on for the host sync update before taking the plunge. Slide effect is extremely cool. Great for loops and drums. Fantastic Thin effect. Creatively unpredictable. No host tempo sync yet. Currently VST-only. Patience needed. Slip-N-Slide offers spectral manipulation, with a novel method of alternating between the wet and dry signals. You can set the times for both wet and dry periods using the Slide/Hold and Space parameters, with the stripy bar at the top of the interface illustrating the rhythm. The longest processed slice is roughly half a second and the maximum 'space' almost a second, and you can randomise the timings with the Random slider. As for the actual processing, there are three modes: Slide, Hold and Thin. You can combine Thin with either of the other two, giving five modes in total. In essence, Slide looks at the spectral content of the beginning and end of a processing section and interpolates the sound in between, producing a transition effect. Hold freezes the spectral content for the length of the processing section. Finally, Thin applies a resynthesis filter, whereby only the strongest signal components are heard; you select the number of bands to control the fidelity of this. The main caveat (aside from it being VST-only) is that the plug-in introduces a 500ms processing delay. If you're mixing or working offline and your host software has plug-in delay compensation, everything else should get shifted back to match. Even so, if you're looking at the waveforms or even your timeline marker, you'll probably notice that the audio is delayed. "The main caveat (aside from it being VST-only) is that the plug-in introduces a 500ms processing delay." Unsurprisingly, using Slip-N-Slide on a live input is a non-starter. This is a shame, but as it says in the manual, until someone invents a way to bend time, there's no way around this. For mixing and editing situations, we found that the processing delay didn't hinder our creativity. However, you can never really escape it, so even when you change the mix control from dry to wet, for example, there's a corresponding pause before it takes effect. Disappointingly, there's no sync-to-host tempo option either, although we understand this is in the pipeline. We threw a variety of sounds at Slip-N-Slide with the process time set to maximum (488ms) and an equal Space setting. It quickly became clear just how much Slip-N-Slide's behaviour is dictated not only by the frequency content, but also by how it changes over time. Take a held organ note, for example. This reasonably pure sound is pretty much static, so both Hold and Slide sound quite subtle and similar. However, take a drum loop and the complete opposite is the case. Here, in both Slide and Hold, single sounds such as snares are stretched. The overall impression is of a sound being bent over time, with Slide producing a morphing effect and Hold a frozen one. But you've also got the Thin option to factor in. Add this to either of the other processes and you can get anything from subtle graininess to full-on metallic sounds. In practice, at extreme settings, with Thin set to two bands, a Space setting of zero and quite long processing sections, Slip-N-Slide produces amazingly warped, almost watery effects. What's more, because the unit doesn't sync to tempo, even with random settings of zero, there's an underlying unpredictability to it. At times, this can be too much and you'll probably find yourself bouncing down sections and picking out the bits you like. But if you're willing to enter into its world, Slip-N-Slide can produce some seriously unusual effects. For its sheer wackiness, it's our favourite of ID's plug-ins. Let's hope a tempo sync option arrives soon. 1. Drum kit: flat then with equal process and space settings in Slide then Hold mode. Next, a Space setting of zero and Thin setting of 102 bands, first Slide mode then Hold mode. 2. Piano: flat, then Slide mode with Thin set to 33 bands. Next Hold mode at 70ms with Thin set to 5. Finally, Slide on 418ms with Thin set to 2 bands. 4. 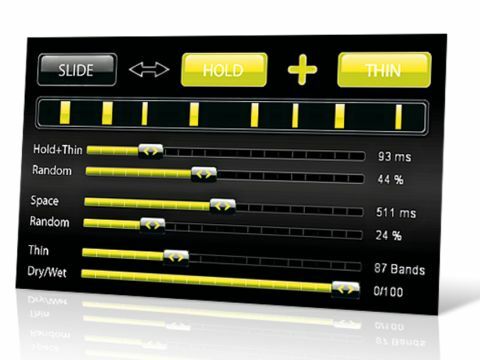 Acoustic guitar: flat, then a Slide setting of 209ms with a Thin setting of 28 bands.